We were re-introduced to the Salade Lyonnaise at our delicious anniversary dinner a few weeks ago. I say re-introduced, as David has had more than his fair share of this particular salad at the bakery he used to work at in Portland. He was eager to try his hand at making it himself. 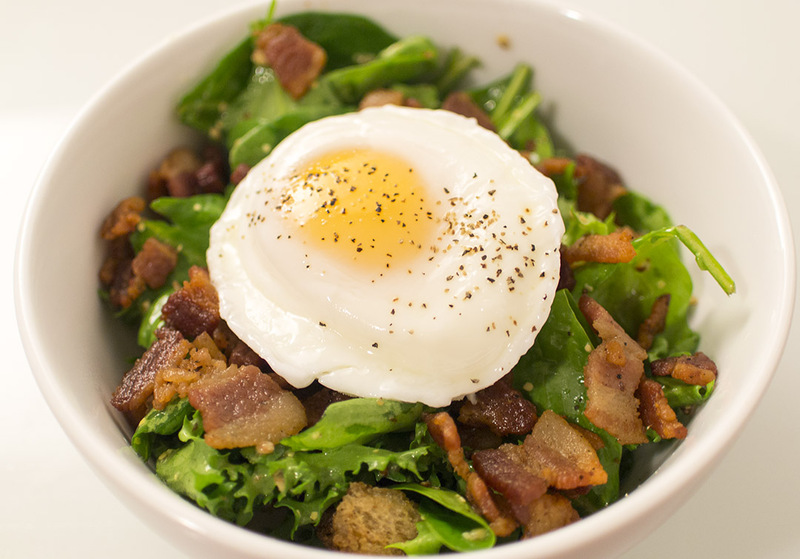 It is a brilliant concept–salad with bacon, croutons and topped with a poached egg. Simple yet delicious. Pan fry bacon until it is done to your liking. Once done, remove the lardons and set aside. Reserve 1 tbsp of bacon fat for later use. Toss the bread cubes into the bacon fat and sauté until golden brown. Set aside. To make the vinaigrette, place mustard, vinegar, reserved bacon fat, oils and a ¼ tsp salt in a jar and seal. Shake to blend. Clean lettuce and spinach leaves and chop into bite-sized pieces. Place into a large bowl. Mix in half of the lardons and croutons. Add in dressing and gently toss to combine. Divide salad into smaller bowls. Sprinkle remaining lardons and croutons on top. Poach the eggs and place an egg on top of each serving. Season with black pepper. It is perhaps not surprising that we thoroughly enjoyed a salad that contains copious amounts of bacon and poached egg. I will say that David was a bit enthusiastic with the bacon, and I (shockingly) noted that I could actually have a bit more green stuff (the ratio of green to non-green content was somewhat skewed in favor of the latter). It’s a delicious vinaigrette, light and simple, allowing the egg, bacon and croutons to really shine. David commented that the vinegar flavour wasn’t as potent as he would’ve liked. He noted that the only white wine vinegar we had was the cheap Safeway brand and that a higher quality vinegar might add a better flavour (or just adding a bit more to the dressing).